UPDATE: Conyers' lawyer said that Pelosi "sure as hell" won't be telling him what to do. "It is not up to Nancy Pelosi. Nancy Pelosi did not elect the congressman, and she sure as hell won't be the one to tell the congressman to leave." In a pretty stark departure from her interview on "Meet the Press" on Sunday, when Rep. Nancy Pelosi (D-CA) referred to embattled Rep. John Conyers (D-MI) as an "icon" who should remain in Congress, she now thinks that he should resign. Pelosi made the comment to reporters on Thursday morning. 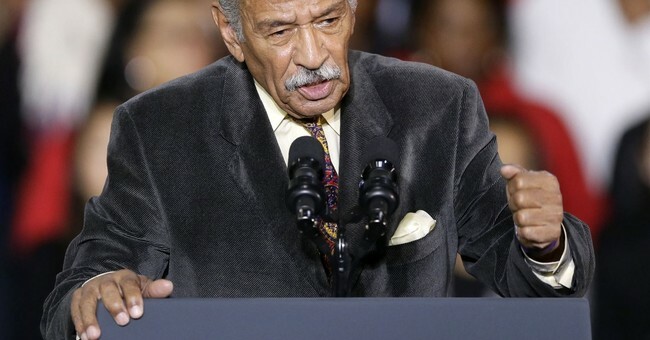 PELOSI: "Congressman Conyers should resign"
Conyers has been accused of sexual harassment and misconduct by numerous women. He settled at least one of those complaints. Journalist Cokie Roberts said on Sunday that it was widely known among female reporters to avoid being in an elevator with the Congressman. His staffers have complained that he made the office "toxic." Since the allegations became known, many have called for Conyers to step down, including Rep. Kathleen Rice (D-NY) and (according to reports) fellow members of the Congressional Black Caucus. He has resigned from the House Judiciary Committee, but has insisted that he will stay in his seat and will remain in Congress. Conyers was first elected to the House of Representatives in 1964. On Thursday morning, Conyers was hospitalized for a "stress-related illness."